The street that downtown Las Vegas is located on is called Fremont Street. This is were Binion, The Four Queens, The Golden Nugget and many others are located. This is truly old Las Vegas. I was playing no limit at the Golden Nugget on Fremont Street. A new player came to the table. At first glance he was dressed in a suit that was fresh out of the 1930's. He was wearing a hat and carrying a violin case. 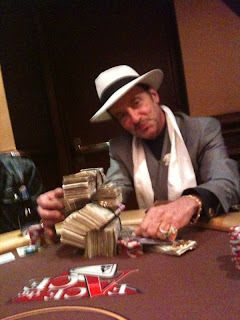 He was warmly welcomed by the casino staff and a number of the players in the room greeted him by name "Duke". When he arrived at the table he opened the violin case and began removing money. There were bundles of $100 bills. He also had vintage currency including a 1000 dollar bill. All of this neatly stacked. I asked another person at the table who he was and the reply was "the Duke of Fremont". No one seemed to know if his real name was Duke or not. After the fan fare died down, the Duke held court. Everyone at the table was focused on the Duke. The cards became incidental. He reminisced about a recent trip to the Amazon. He described the various rare currency that he had on the table. At one point in a hand, I ask him how much he had back. He said that give or take a grand he had $186.000.00 on the table. My $200 was no threat to his stack. He played one hand that he lost, packed up his money made his exit. Quite a character.